Here are VIA 693 from Tuesday and VIA 1 from Thursday. VIA 693, ex-Hudson Bay, first. I waited just west of Carman Junction for the train in the bright sunshine. I had brought along my Canon S3 to use as a video camera, but when I went to set up I realized I forgot the tripod. I didn't even have my GorillaPod with me so there was no place to set the camera down and take decent video. Oh well. I mentioned previously that shooting the Hudson Bay is a bit dull, so I figured I would try a little blur shot. I set the shutter speed on my T1i to 1/30s and took this shot. I'm fairly pleased with the outcome. The engine nose could be a bit sharper. I shot each car as it went by and then got the David Morris Going-Away Shot™. Note the bit of yellow behind the train, canola in a far-away field. I have to find a place to shoot trains with canola in the foreground! I went out on June 28 (Thursday) to shoot the Canadian. I waited a little west of Shaftesbury Boulevard for VIA 1 and it came along on time. This time I remembered the tripod. Here's the video from my Canon S3. As soon as the Canadian went by, I took off in pursuit. I was hoping for a stop signal at Diamond or at least a Limited to slow it down enough for me to catch up. I was held up by a slow driver on Wilkes so I didn't draw abreast of the train until after the hotbox detector at mile 10. Unfortunately VIA called out "Clear to Diamond" so there would be no chance to get ahead. I pointed my camera out the side window of the car and took a few pacing shots totally blind. I was quite pleased with how this one turned out. I didn't even have to level the horizon! After that I slowed and the Canadian disappeared in the distance. I turned around and headed back east... only to.... well, that's another post. Here are a few "catch up" photos of individual trains I've seen over the past couple of months. The above is CN 8812 leading IC 2700 into Winnipeg on April 18. The early morning sunlight is bright on the nose of 8812 and its waving crew. Later that same day, I caught another Illinois Central unit, IC 2714, leading train 198 into Winnipeg ahead of CN 2513. Fast-forwarding a bit, I had a bit of luck and caught CN 532 on June 14. I was driving over the tracks at the Perimeter when I spied a headlight to the north. A quick exit brought me to the nearest crossing (mile 5.30) where I shot faded CN 2414 leading a very long train. It's amazing how one little engine can pull so many cars. The Letellier subdivision that CN 532 runs on is very straight and flat. There were several interesting flatcars on the train. They were all bearing the COER reporting mark, belonging to the impressively-named shortline the Crab Orchard and Egyptian Railroad. Any idea what these cars were used for? Two days afterward, I caught a large CN freight near Carman Junction. The train had CN 8927 leading CN 2440 and CN 8862. They had a clear signal on the south track. As I watched the train roll by, I was surprised to see a DPU engine, CN 8007, midway through the train. Not many of CN's general freight trains have DPU engines. As I alluded to in a previous post, I saw a lot of stuff on May 5. I was out with the kids, shooting trains and doing kid stuff. First up was VIA 1, the Canadian, at St. James Junction. Photos are here and here. They had a couple of dead-heading cars that I neglected to mention in my previous post, namely diner Acadian and this HEP 2 car, VIA 4122. It's always neat to see deadheading cars on the Canadian. The kids and I headed up Pembina Highway, as I was intending on seeing what was around the CP Winnipeg shops. On the way, I saw an eastbound freight stopped at Subway by the Winnipeg Maintenance Centre, with CN 8003 and CN 5701 for power. As we approached the yard, driving down Logan Avenue, I noticed a train working a grain elevator nearby. A quick detour brought me to view CP 3106 working the elevator. I watched for a few minutes, and lo! the train started to roll toward me. This was not my first time shooting CP 3106! Continuing on, we ended up at the sports field just south of the shops. We went across the field and I started shooting. There was a variety of power there. There were a fair number of SD40-2 engines were there, including multimark units CP 5927, CP 6019 and CP 6055. Red SOO-painted 6062 was there as well, although not in a very photogenic location. The usual few AC4400 engines were around, such as CP 8515. Also present were ES44AC engines CP 8764 and CP 8823. Dual-flag SD90 CP 9550 was present, but again was not in a location that I could show the dual flag logo very well. The paint used for the under-cab numbers on the SD90s seems to have been very poor. It seems like every CP 95xx engine has faded numbers. I spotted new engine CP 9355 bringing an intermodal train in, but it was far away and all I managed was a shot through some trees. By this time, my kids were getting pretty bored so we went to the playground and had some fun there, then headed home. As always, you can see the complete day's sightings in my database. Here are a few recent VIA trains that I've seen. On April 23 I shot the Canadian rocketing out of Winnipeg. I was near Diamond but I didn't have a lot of time to get ready. I got this shot of VIA 1 but did not get the full consist, since the train was zooming along at 60+ MPH. On May 5 I had a busy day of railfanning (to be detailed in another post) and I made sure to see the Canadian first. This time I was at St. James Junction. Nice to see the big summer trains again. Here's the video. I shot it with my Canon S3 mounted on my GorillaPod so it's pretty low to the ground. Finally, I shot the Hudson Bay VIA 693 leaving Winnipeg on June 20. This was taken just west of Shaftesbury Boulevard. This is a very typical 693 with two engines, a baggage car, two coaches, a diner, and a Chateau car. The going-away shot... notice the large backup light on the end for the long backup move into Thompson. It's been a while since I've shot VIA 693! I'm much more interested in the Canadian because A) it's much longer, and B) the equipment varies. The Winnipeg-Churchill train tends to have two units and exactly the same type of cars on it every time. Not quite as interesting but hey, it's a train, it's all good! It's been a while since I've seen a GMD1. I stumbled across this pair working the local industries just north of Symington Yard here in Winnipeg. CN 7044 and CN 1435 were just north of Canada Gypsum (here). I honestly had no idea they were there when I turned onto Camiel Systems Street. I saw them approaching the road crossing just as I was, so I came to a stop, and so did they. It was raining so I did not spend a lot of time photographing them. It looked like they were doing a crew change. I think they had trainees (in the bright green vests). CN 7044 is equipped for remote control operation, as indicated by the light on the roof. Note the odd looking number boards. There are a few industries on that spur. I've indicated the type of traffic they would have. It would make a nice little industrial park on a model train layout. Sometime when the weather is nicer, I'd like to go take some photos. On June 8 I took a quick trip over to Symington yard to see what was going on. I finally saw the three SD40 engines and the slug up close and took a few photos. The consist was CN 203, CN 6005, CN 6009 and CN 6012. They were running light through the yard, maybe to go pick up another string of cars. I shot another set of the "dogs", GP38 CN 7528, slugs CN 504 and CN 502, and GP38 CN 7532. Look closely behind the slugs. Yeah, that's right, Rocky Mountaineer cars. It's a real shame I didn't actually notice those cars at the time. Grrrr. CN 2282 and ex-BNSF CN 2197 were pushing a train back into the yard. I've never seen CN 2197 before but I saw CN 2282 back on January 30, 2010. PS: I wrote about Symington's "humpyard dogs" here and here. While I was waiting, I heard the detector at mile 10 go off, so I knew something was coming from that direction. After a bit longer, I saw headlights to the west. It turned out to be CN 2525 and CN 2602 leading a shortish general freight train on the south track. Right after that, I saw VIA 1's lights come around the corner at Portage Junction to the east. I was quite concerned that I would get skunked by the freight train. First things first, shoot the freight. As VIA approached, it looked like they were slowing down. I was hoping they would have to stop short of the junction to change tracks after the freight went by. Here's the two trains approaching the meet. My hopes of a VIA stop were unfounded. The Canadian rolled right on by, shielded from my view by the freight train. This was basically my view of VIA 1 passing. I did take a couple of long-range shots of the Canadian going away, after the freight train got out of the way. I knew there was no point in trying to chase the Canadian as it was very unlikely I would catch up to it. Oh well, you can't win them all. Here are some trains I saw at the Gare du Nord in Paris, France. Most of the platforms are accessible without any tickets or security checks, which I found a bit odd. The Eurostar platforms are glassed off and you must go through significant security to gain access to the trains. I'll get into that in another post. The local RER trains require a ticket to access those platforms. SNCF is the French state railway system. They operate numerous trains, including the TGV high-speed long distance train and local trains under the banner of SNCF Proximités. One of the local train brands is the TER, for Transport Express Régional. I spotted a couple of TER trainsets at the Gare du Nord. These are multiple-unit trains made by Bombardier. I can't figure out if these are diesel or electric or both. TER operates several different types. I remember seeing a TER train flashing by at one of the castles we were visiting (Chenonceau). This ugly duckling was at the head of a train. SNCF 116043 is a "class BB 16000" electric locomotive. It operates on 25 kV power, and 62 of these were built between 1958 and 1963. This locomotive has more tractive effort than a GP38-2. I think this was another locomotive-hauled train. I did not walk down any of the platforms so I don't know what was at the other end. Maybe another "ugly duckling"? Of course, there were TGV trains in the Gare du Nord as well. This one is a little different than the TGV sets I showed at the Gare de l'Est. Set 3226 is a British Rail Class 373 train. It was built by GEC-Alsthom for Channel Tunnel operation between London, Paris and Brussels and the series is called "Three Capitals". I don't believe these SNCF-owned trainsets actually go through the Channel Tunnel any more. Here's a Thalys high-speed train. 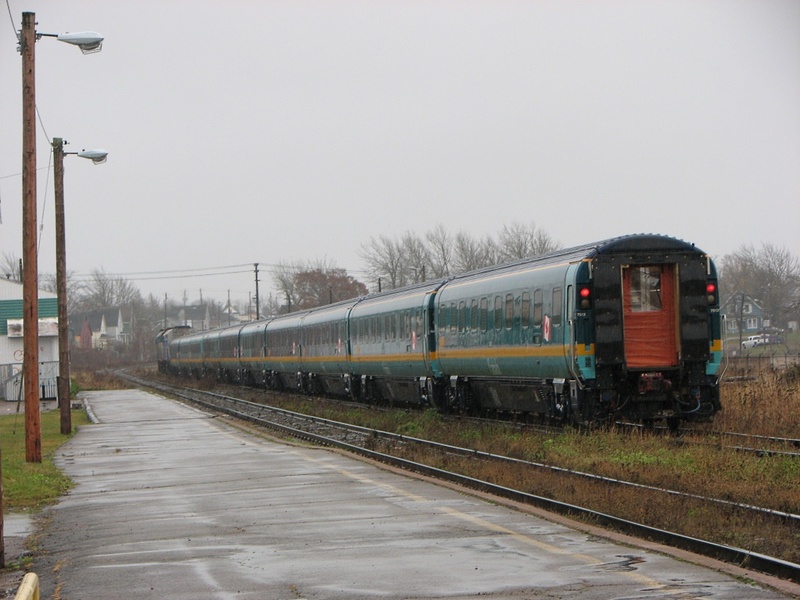 Extra: The VIA Rail Renaissance cars were originally intended for the "Nightstar" cross-channel service. The intention of Nightstar was to provide sleeper service between Paris or Brussels and English cities north of London. For several reasons, mostly due to the privatization of Britain's rail network and the cancellation of regional Eurostar services, they never operated and were put in storage before being purchased by VIA Rail. As I mentioned, I was in France last month. I already blogged about the Gare de l'Est in Paris and now it's time to talk about the Gare du Nord. The Gare du Nord ("north station") is quite large and serves local trains, long-distance trains to the north of France, as well as international trains to Belgium, the Netherlands, northern Germany, and of course the UK using Eurostar through the Channel Tunnel (incorrectly known as the "Chunnel"). The front of the station is quite imposing, with the big columns and statues. Inside it is big and airy. It was quite busy all three times I was in the station, with many people standing around looking at the arrivals or departures boards, or shopping at the various vendors. The arrivals and departures boards are quite imposing. One evening I took a walk through and shot some of the trains waiting at the platforms. Here's SNCF TGV trainsets 13 and 81 waiting at the platforms. Both sets are TGV Sud-Est types originally built for Paris-Lyons service. They carry a maximum of 345 passengers and most are capable of 300 km/hr travel on the dedicated TGV tracks, or 200 km/hr on normal track (lignes classiques). I also saw a couple of Thalys trainsets, including set 4533 here. These are TGV Réseau sets dedicated to Thalys service between Paris and Amsterdam. You may remember I saw a Thalys train in Amsterdam back in 2008. I have some more train photos from the Gare du Nord from my other visit and I will post them next.